We want to raise awareness of the importance of preserving the environment for themselves and future generations by pointing an informed choice in consumption. We believe that the use of biodegradable and environmentally friendly cleaning products will be strong growth in the coming years and we intend to meet this demand with a wide range of products both ecological and high efficiency. and, the company’s suppliers also use manufacturing practices with the highest standards (ISO) without animal testing. PURE extracts the best cleaning ingredients from coconut, corn, sugar cane, natural minerals, and essential oils. For example, their surface cleaner turns coconut into a cleaning agent that polishes surfaces like windows and mirrors, rather than using ammonia, which is irritating and harmful to the respiratory tract. PURE scents combine essential oils and sweet flavors developed in collaboration with the team of another Canadian company, oNature. All formulas are free of harmful chemicals like phthalates, formaldehyde, toluene, benzene, methylene chloride or hormone interference chemicals. 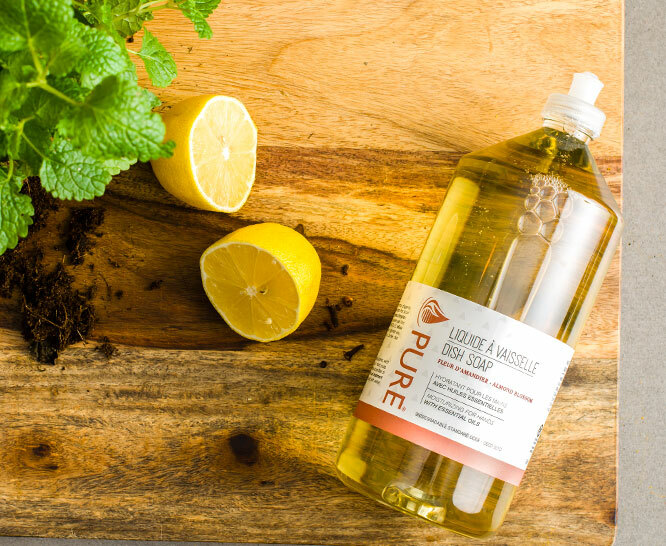 PURE products are sold in bulk at our filling station — simply reuse the containers you initially purchase (which are also made in Canada) that are made from BPA-free PET and HDPE recyclable plastics. BONUS: using PURE bulk products also saves you 25%! Being green is a logical choice with PURE!